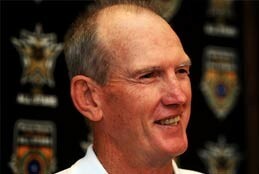 Wayne Bennett is the most successful coach in Australia Rugby League. Wayne was the coach of the Brisbane Broncos for 21 years between 1988 and 2008. He was then lured to St George-Illawarra, taking the team to the 2010 premiership, its first in 31 years. Known for his innovation and influence, Wayne is the longest serving coach of a single club in history, has one of the best win/loss records and is second on total number of premierships as a coach. Having played state and international rugby himself, Wayne began his coaching career at club grade in 1976. He became the Queensland Director of Coaching in 1986 then head coach of the Canberra Raiders the following year. In his first season at the helm, the Raiders made their first ever Grand Final and Wayne was named Coach of the Year. Wayne became the inaugural coach of the Brisbane Broncos in 1988. Under his tutelage, the club would win five premierships, two World Club Challenge titles and three pre-season titles. Wayne was the irresistible choice of coach for the Queensland State of Origin sides of 1987 and 1988 and later the inaugural Queensland Super League coach for the 1997 tri-series against New South Wales and New Zealand. In 1998 he again coached Queensland in State of Origin, taking the team to an historic 2-1 series win. Following the Broncos 1997 success, winning both the Telstra Cup and Visa World Cup Championship, Wayne was named the Super League Coach of the Year. In 1998 Wayne became the first to coach his club, state, and country to victory in the same year. This feat would see him named Queensland Coach of the Year and Australian Domestic Team Coach of the year, all this while still finding time to earn the award as Queensland’s Father of the Year. Wayne was named coach of the year again in 2000 as the Broncos won both the minor and major premiership. In 2001 the Queensland Government added Rugby League to the Queensland Academy of Sport program and appointed Wayne the Director. Since joining St George-Illawara, Wayne released his autobiography; The Man in the Mirror.